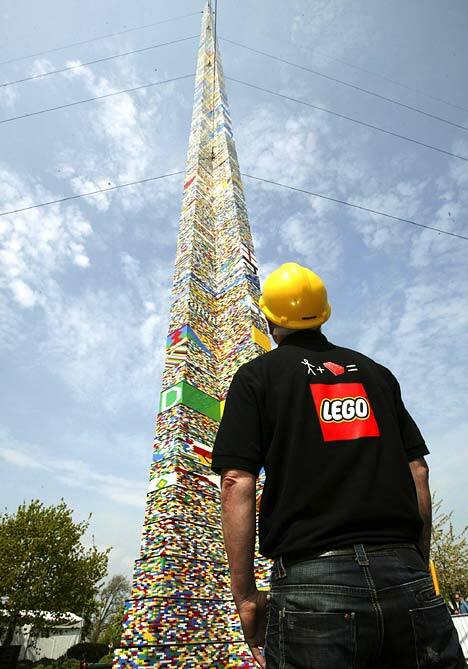 500,000 Lego bricks, a crane and the efforts of thousands of children created this giant tower. 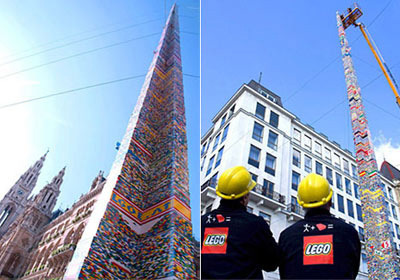 In honor of Lego's 50th anniversary, Lego employed the help of thousands of children, about 500,000 Legos, and a crane to topple the old record for the world's tallest Lego tower (previously held by the Windsor Legoland). The tower, which beat out the old record by about 7 inches, was built earlier this week in Vienna. About 3,000 children helped assemble chunks of the tower and then professionals used a crane to add the pieces all the way up to 96.7 feet high. Besides a couple of wires to secure it against winds, the tower stood on its own with a hollow center and a shape that was said to represent the old Viking long boat masts.